Most types of cheese that consumers have become accustomed to seeing on store shelves are produced from the milk of three animals: cows, sheep, and goats. The milk from other animals is used as well, such as water buffalo's milk, which traditionally was used to make Italian Mozzarella cheese; but the milk from cows, sheep, and goats contributes to the greatest share of worldwide cheese production. Of these three, cow's milk is by far the most widely used milk for cheese making, especially in the United States. The characteristics of cow's milk vary significantly between various breeds of cows, thereby contributing to the extensive differences in the countless number of cheeses produced from cow's milk. There are more than four dozen breeds of cows that produce milk suitable for making cheese. The majority of the mild and subtly sweet white milk that most of us have become accustomed to is obtained from Holstein cows (or Friesian cows, as they are known in Europe), which are the highest production dairy animals. On the other hand, Guernsey cows, which are also high production dairy cows, produce a pale yellow milk that contains much larger fat globules, resulting in a flavor that is much smoother and richer than the flavor of the milk from Holsteins. Some of the best cheeses in the world are made from sheep's milk and goat's milk; however, in the United States, the demand for these cheeses is quite limited. In America, there seems to be an unwillingness to embrace the cheeses produced from sheep's milk and goat's milk with the same enthusiasm as cheeses produced from cow's milk. Of course, the enormous production advantage that cow's milk has over any other type of milk perhaps has as much to do with this as anything else. There are some types of cheese produced from milk obtained from non-animal sources. Cheeses produced from soy milk and rice milk are becoming increasingly popular, as some people are becoming much more health conscious and wish to cut the amount of fat in their diets. 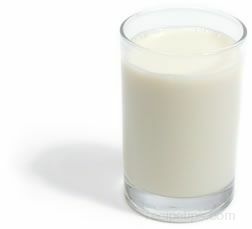 Soy milk is a nondairy milk substitute made from dried soybeans that have been soaked, ground, and cooked before being processed into a milky liquid. 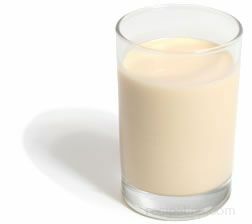 Soy Milk is often thickened to appear more like common milk, and it is flavored with honey, vanilla, or carob to alter the mildly bitter taste that would be quite noticeable without the flavoring. The Soy Milk sold in Asian food stores has a stronger flavor than milk sold in general food stores. Flavors available include vanilla, chocolate, chai, and latte. Cholesterol free and low in sodium, fat, and calcium, soy milk is high in protein and rich in iron. Since brands may vary on the types and amounts of the nutrients added to their product, it is best to check the label carefully. Soy milk is available in a liquid or powdered form and as a low-fat or whole milk beverage. Low fat soy milk had a lighter texture similar to skim or low-fat varieties of cow's milk. Soy milk can be substituted for cow's milk in many recipes. It works well in baked desserts, dips, sauces, some soups, and stews; however, since it contains very little saturated fat, it will not set up as well as milk from dairy cows. This characteristic makes it unsuitable for some sweet fillings in pies, pastries, and other baked goods. Caution is suggested when combining soy milk with acidic foods, since soy milk has a tendency to curdle (unlike cow's milk, which does not curdle with acidic foods). It also will typically not work well for savory foods, such as lasagna. It is always best to test the brand of soy milk that you wish to use for a recipe, since not all brands work as well as others. Rice milk is a liquid made from the cooking and blending of white or brown rice and water. It can also be made using rice flour. Since it is a nondairy product, it can be used as an alternative to milk for people who are lactose intolerant. It can also be used simply as a beverage, a flavoring agent, or as an ingredient in various recipes. Rice milk is also known as amazake, a thick fermented liquid served commonly in Japan. Look for rice milk in Asian markets and well-stocked food stores. The flavor of cheese is also greatly affected by the diet of the milk-producing animal. 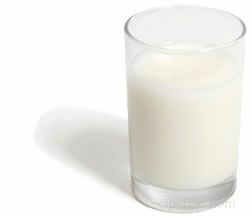 The taste, aroma, color, texture, and fat content of the milk (and the resulting cheese) can all be attributed to this. Just as cattle, hogs, and poultry are fed specific diets to achieve various results in terms of the quality and flavor of the meat obtained from them when they are slaughtered, so too are milk-producing animals fed specific diets to achieve particular results in the quality and flavor of the milk. It should be quite apparent to most people that the characteristics of the milk obtained from cows fed on fresh mountain grasses, clover, and natural pasturelands will be quite different than the milk obtained from cows raised on commercial feed or silage. This is one reason why many of the European cheeses, produced from milk obtained from cows that feed only on mountainside pastures, are among the best in the world. Certainly the geographic region, geology, and type of soil affect the various characteristics of milk and cheese; in fact, these considerations can even determine the type of cheese that can be made. For example, volcanic soils support different types of grasses than clay soils. The different grasses of the volcanic soils will absorb different elements than the grasses grown on clay soils, which results in milk that has slightly different characteristics between the two. The differences may be quite subtle; nevertheless, it all contributes to the differences in the various cheeses. The seasons also contribute to the taste and texture of different cheeses, especially when considering the grazing patterns of milk-producing animals in temperate zones that do not rely solely on human keepers for a majority of their food. These animals will follow the spring growth patterns, feeding on the young tender chutes emerging from the ground. In early summer, grazing becomes more stationary, as the explosive growth in vegetation provides plenty of food. Late summer results in another period when animals move about to forage, because the food is less abundant on the dry brown land, the result of the arid weather patterns of that time of year. Autumn brings a second but shorter season of plenty, as rains return to many temperate regions; but winter results in grazing animals having to move inside, relying on the hay and feed that their keepers have stored. All of these differences—the changing seasons, the differences in the abundance and types of food available—have an effect on the flavor of the milk, and consequently, on the flavor of the resulting cheese produced from the milk.